We’d all like to eat ice cream for breakfast but unfortunately the world would fat-shame us if we did (boo!) Thankfully the acai berry offers up an almost equally delicious, but much healthier alternative! Taking Perth by storm, these magical little berries from Brazil are whipped up into a berrylicious ice cream-esque smoothie bowl and topped with extra fruit and granola for some added crunch. Sounds delicious, right? The good news is there are a whole bunch of awesome places in town that have gotten on board the acai train, here is where to find Perth's best acai bowls. Feel like a healthy bowl full of superfoods and fruity goodness after your morning dip at the beach? Head to Yelo in Trigg and grab the acai bowl, blended with coconut water and sprinkled with their homemade granola and fresh fruit. For the prettiest acai bowl in town head to Pixel Coffee Brewers in Leederville. This beauty is topped with fresh fruits, nuts and goji berries (super healthy! ), as well as the prettiest edible flowers you ever did see. Trust Hylin to serve up one of Perth's best acai bowls. Theirs is mixed with banana, berries and coconut water and topped with kiwi, apple, banana and granola. 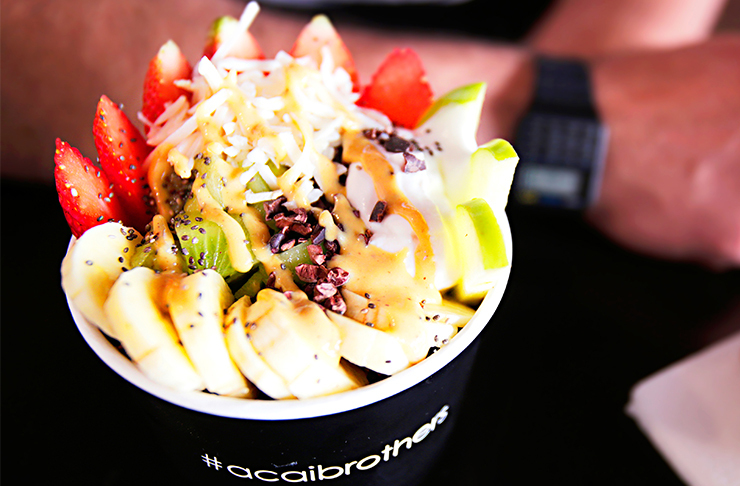 With flavours like raw Nutella, ain’t nothin’ butter (peanut butter of course) and the popeye which is full of spinach and all sorts of superfoods, you can enjoy Acai Brothers' bowls at any time of the day and be left feeling super healthy. Plus, they serve a great cup of coffee. For your quick acai fix, The Market Juicery in Leederville have you covered. Grab their acai smoothie bowl with toasted muesli, banana, strawberries, chia seeds and coconut. Perfect for a healthy breakfast or lunch on the run! We can't forget to add Bowl'n to the list of Perth's best acai bowls! The OG, made with acai, banana, raspberry, blueberry and coconut water, tastes as good as you are imagining, especially when you add their peanut butter and jelly mix. OMG! 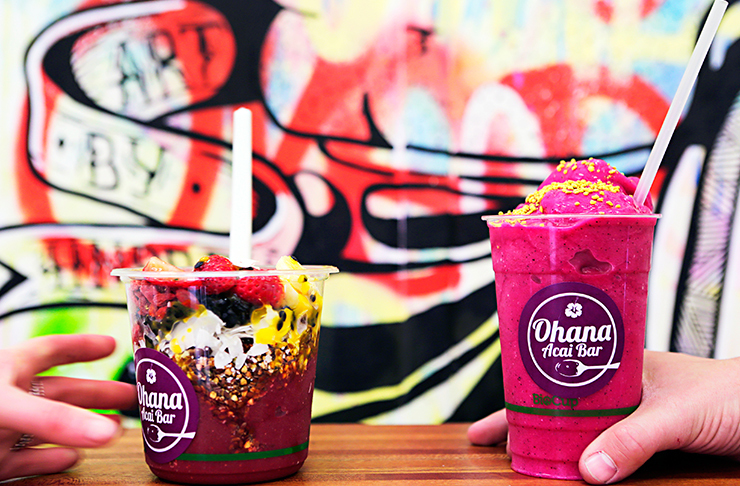 No surprises Ohana Acai Bar serve up Perth's best acai bowls! Choose between a banana or mango base mixed with acai berries (obvi) and strawberries, plus a dash of agave to sweeten things up a bit. Then choose two fruit toppings—we like passionfruit and blueberries. Each Ohana bowl comes with their home-made raw, nut free and paleo granola, but you can also add two extra crunchy toppings (go for the macadamias and cacao nibs)! After all that goodness you can choose two superfood boosters—there are goji berries, hemp seeds, bee pollen, chia seeds, dried cranberries and dried blueberries. Ohana Acai Bar have got the goods! Famous for their acai bowls, Roots & Greens cafe is all about the vegan vego life. This is the perfect place to pick up an acai bowl on the go. If you're trying to eat that little bit healthier but still have a chronic sweet tooth, The Acai Corner has got your back with their all natural Ferrero Rocher Bowl that will be sure to do the trick the healthy way. Yep, that's right. An acai bowl topped with homemade Nutella, homemade granola, buckini, cacao nibs, strawberries and banana—yum! But the amazing bowls don't stop there. Think detox, coco-loco, choc mint, peanut butter and more. The Acai Corner is the only Acai place in Perth who offer natural bowls with no sugar and all of their bowls have the option of natural or sweetened and if you don't know the different the team will talk you through it! Want more healthy goodness in Perth? Here’s 10 Of Perth’s Best Breakfasts!